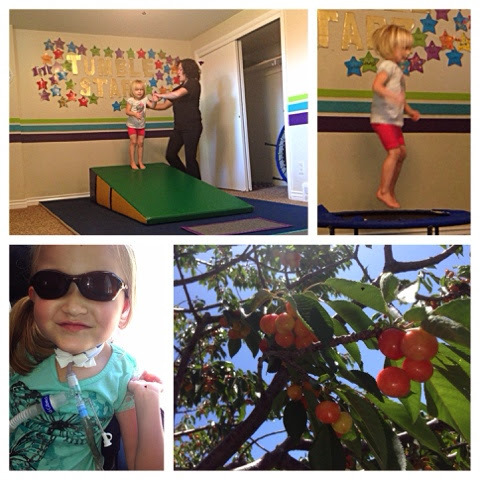 PRESLEY & CHARLOTTE'S CORNER "You've taught me in your lifetime More than I'd learned in mine. And you do, you do, you shine." So far the first week of summer VACAY has been fabulous!!! Day 1 was Ammons birthday and we went to the Dino Museum and had a party!!! At the Dino Museum they even scored big points with me and Pres when we discovered the wheelchair accessible Dino Dig!!!!! Yahoooo! We went to mommy's favorite place (Midway!) and went to Gramma Varneys party at the Chalet!!! It was so much fun!!! Ps Charlotte is the funniest and spunkiest poser!!! Day 3 was family Dinner at Gramma and Grampa Gleason's and getting ready for surgery for Day 4. Surgery went well! 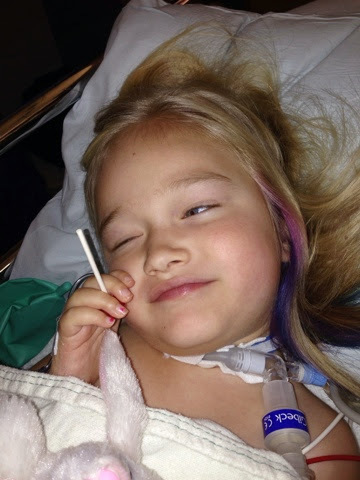 She lengthened her rods to the max and next surgery may be a big one! 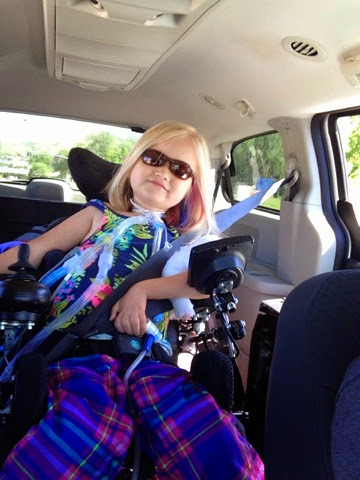 She rode home in style with her Oakleys with the window down only 2 hours post surgery! Rock. Star! Day 6 was TUMBLING (first time!!) for Charlotte! It was so much fun and I am already So happy I got her signed up! It's at our neighbors home so it is so easy to walk up with the girls! Then we discovered our cherry tree was coming along quite nicely and realized the birds were eating the reddest ones!! So we picked some early and they were soooo good still! 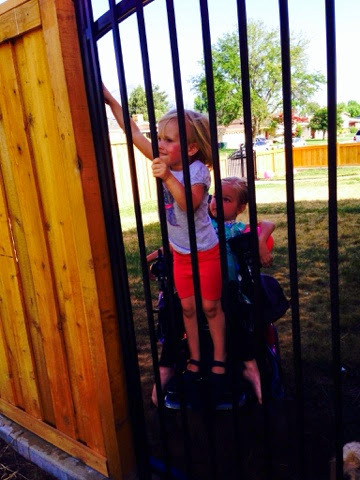 Charlotte and Presley discovered that together they can open the gate!!! "Hop on Charlotte, I will raise my chair....good....okay now lift the handle and open the gate so we can run away!!!" So we were going to do the usual: Presley on speed 4 cruising and doing her speed thang and pcharlotte scootibg on her scooter....but last minute we decided to rent skates for both girls (and of course I brought my *blades* from the 90's and we ROCKED THAT RINK!!!! 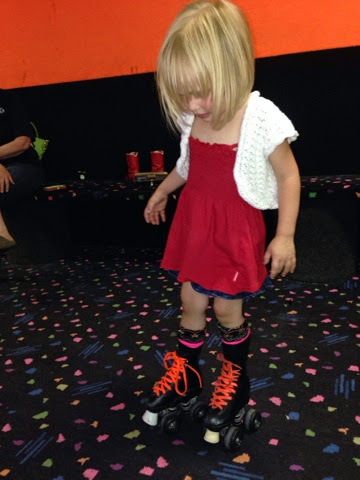 Presley was BEAMING that she was really skating with everyone else!!!!!! Best day!!!!! 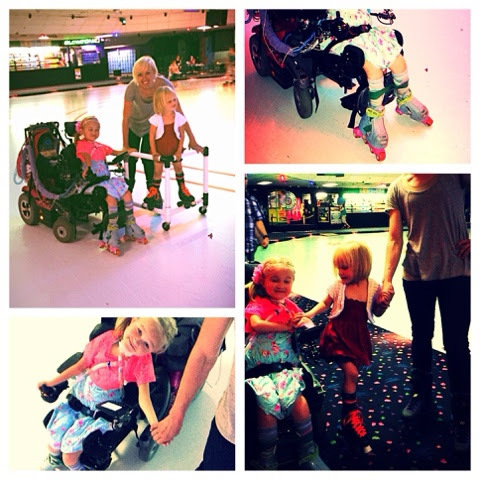 I'm always happy to see how Presley and Charlotte are doing (Nate's grandma here!) These little smardypants bring so much joy. Jackson Lab-make sure you specify its for "SMARD RESEARCH"
We feel like we are the luckiest mommy and daddy in the whole world! We have 2 of the sweetest girls who we love so much! Presley Sue is 3 years old and the girliest little girly girl ever! She loves puppies, bubbles and butterflies! And adores her adorable baby sister! 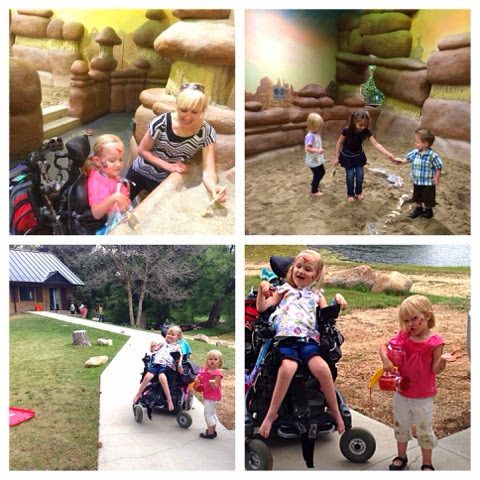 At 2 years old we learned that Presley has an extremely rare genetic disease called SMARD (spinal muscular atrophy with respritory distress.) 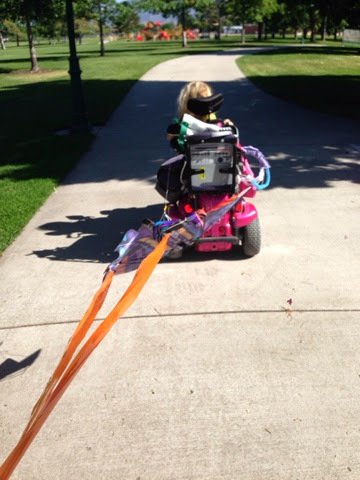 She lost her ability to walk, eat normal and breathe. 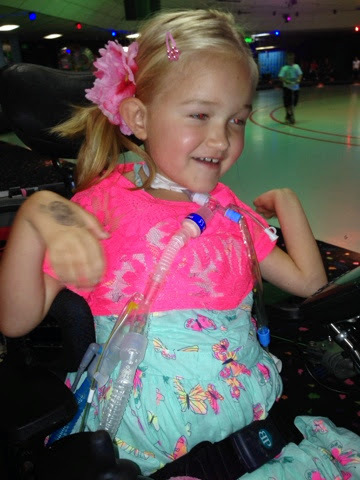 She is trach/vent dependant now-and is the happiest most beautiful girl with such a love for life! She smiles non-stop and has changed our world! She truly shines inside and out! Charlotte Mae is our newest little princess! She was born in March and since then has been the sweetest, most cuddley little cutie you could ever imagine! She is definitely a momma's girl, which I totally LOVE! And I could cuddle her all day! She is a mover and always on the go!! She loves chasing our dog and playing with her awesome big sis! Presley and Charlotte LOVE their pup! !